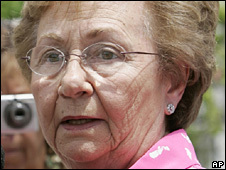 A sister of Cuba's former long-time leader, Fidel Castro, has admitted spying for the CIA in the 1960s. Juanita Castro, who now lives in Miami, said she had gathered sensitive information for the US for three years. In her memoirs, she said she had fallen out with Fidel and her other brother Raul - Cuba's current president - over the killing of their opponents. Ms Castro, 76, said she had helped to warn and hide Cuban dissidents before finally fleeing the island in 1964. There has been no immediate reaction from the US or Cuban governments. In her memoirs - Fidel and Raul, My Brothers, the Secret History - Ms Castro says she was recruited by the Central Intelligence Agency in Havana two years after the 1959 revolution brought Fidel Castro to power. She agreed to help because she had become disenchanted when Fidel abandoned the nationalist democratic revolution he promised and instead imposed a one-party Marxist state "simply out of the need to hold power", she said. "Did I feel remorse about betraying Fidel by agreeing to meet with his enemies? No, for one simple reason: I didn't betray him. He betrayed me," she wrote. "He betrayed the thousands of us who suffered and fought for the revolution that he had offered, one that was generous and just and would bring peace and democracy to Cuba, and which, as he himself had promised, would be as 'Cuban as palm trees'," she wrote. Ms Castro said that at a meeting with a CIA officer called "Enrique" at a hotel in Mexico City in 1961, she was given the codename "Donna" and codebooks so she could receive instructions. She agreed on the condition that she received no money and was not asked to participate in any violent acts against the Cuban government. She would help people persecuted by the Cuban secret police escape capture, imprisonment and possible execution, often by sheltering them at the home of her mother, Lina Ruz Gonzalez, she added. Ms Castro fled Cuba a year after her mother died, believing she would no longer be protected from the attention of the secret police, and settled in Miami, where she ran a pharmacy until 2007. Raul helped her get a visa to leave. Fidel relinquished power to Raul in February 2008. He has not been seen in public since falling ill in July 2006.